As one of Spain's great cities, Seville is often overlooked in favor of Barcelona or Madrid when planning a vacation. Seville offers just as much history, culture, and fine cuisine as its more popular sister cities, but in a smaller footprint with fewer crowds. Seville promises warm and sunny days, friendly locals and a wealth of things to do. And as the capital of Andalusia, home to Europe's oldest city (Cadiz), the magnificent Alhambra palace in Granada, endless olive groves and Mediterranean beaches, a visit to Seville gives you an array of areas to explore beyond the city. Compass & Key is thrilled to announce our new Seville Destination Guide. We recommend at least three full days in Seville, and our self-guided walking itineraries make it easy to pick and choose how to spend your time. Read on for highlights from the new travel guide. Hotel Alfonso XIII ($$$, hotel-alfonsoxiii-seville.com) is the grande dame of Sevillan hotels, with a veritable who's who list of royal and celebrity guests over it's 88 years. After a $25M renovation is 2012, the hand-painted tiles and wall murals, wood-carved furnishings, and marble floors have been restored to recall its imperial past. We thoroughly enjoyed the enviable location, where you are immediately immersed in the sights and sounds of Seville. Enjoy a cocktail in the Art Deco-style Bar Americano or from the rooftop terrace, open seasonally. The hotel is part of the SPG luxury collection, for all you Starwood fans. For our complete list of curated hotels in Seville, visit the Compass & Key Hotel List. Compass & Key's five itineraries for wandering Seville empower you to explore the city at your own pace, placing you in the right areas to discover new and exciting destinations on your own. Here are the itineraries we would follow with three days in Seville. Day 1: The Heart of Seville, a 5-6 hour walking tour wandering the streets of Santa Cruz, the old Jewish quarter, where many of Seville's best attractions live. Day 2: Royalty for a Day, another 5-6 hour tour exploring the only royal palace still in use today, the Real Alcázar, along with other destinations with a unique connection to historic rulers. Day 3: Seville on Two Wheels + The Gypsy Quarter, a full day of discovery, first by cycle through its history and culture along the Guadalquivir River, then by venturing across the river for an authentic Seville experience in the working class district of Triana. Seville cuisine goes well beyond tapas. Here are three of our favorites. You can also create a DIY tapas tour through stops on our itineraries The Heart of Seville or Local Life in La Macarena, or go for a guided tour through one of our favorite tour groups, Not Just a Tourist. Make sure to try Tinto con Limón, a simple yet refreshing treat of red wine served over ice with sparkling lemonade. For a complete list of recommended restaurants, visit our interactive map. Taberna Del Alabardero, an upscale restaurant in the heart of the Arenal district, based out of a 19th century home. Abantal, featured in our Royalty for a Day itinerary, and one of two restaurants in Seville with a Michelin star. La Azotea Sevilla, a popular restaurant with several locations throughout Seville. Enjoy traditional Spanish dishes like Salmorejo, a tomato soup with Iberian ham. 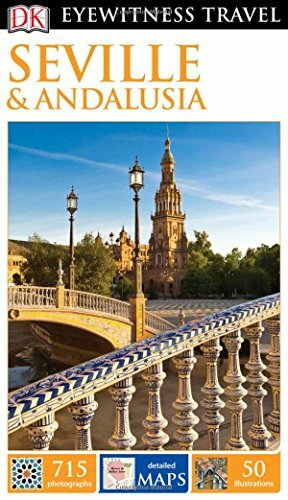 If you're planning on exploring beyond Seville, this Eyewitness Guide is ideal. Includes detailed illustrations of both the Cathedral and Real Alcázar. Not Just a Tourist is a Seville-based tour company founded and run by two locals, offering a range of distinctive tours in and around Seville. Compass & Key enjoyed our first tour so much that we signed up for a second! For more information to plan a vacation of discovery to Seville, click below to see the full destination guide.